It can be hard to eat healthy food. I’ll be the first to admit it. There are so many unhealthy choices out there. When I read the nutritional info on many processed and prepared foods, I am floored by the amount of sodium, fat and sugar. I feel the key is to create dishes that are so packed with flavor, that it’s not a sacrifice to eat the right things. If you work from the basics and use fresh ingredients, then you're in better control of the final result. And to those with a sharp eye, there are no toasted sesame seeds in this batch. I ran out! 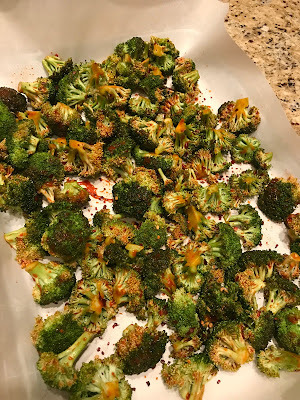 8 cups of Broccoli, cut into larger bite sized pieces. Preheat oven to 425F. Put all other ingredients, except the broccoli, into a bowl and mix well. 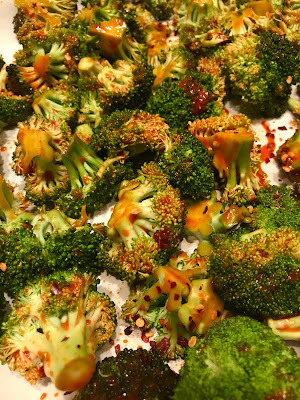 Spoon this mixture over the broccoli and toss until well coated. Turn out onto a parchment lined baking sheet and into the oven for 30 minutes. Give it a stir half way through. Note: Both Gochujang and Shaohsing wine are available at most any Asian market and in many cases in the Asian food section of local grocery stores. However, I will point out that the quality, selection and prices tend to be much better at local Asian markets.